I seriously can’t believe that the holidays are almost here! I really love this time of year and all of the special events and get-togethers with friends and family. And I love any excuse to dress up! I love the outfit above, and the cute hairstyle! You can find the bobby pins shown at my Lilla Rose website. One hairstyle that I’m really loving for special occasions is the headband roll. We did the one above with my daughter’s hair for a wedding. 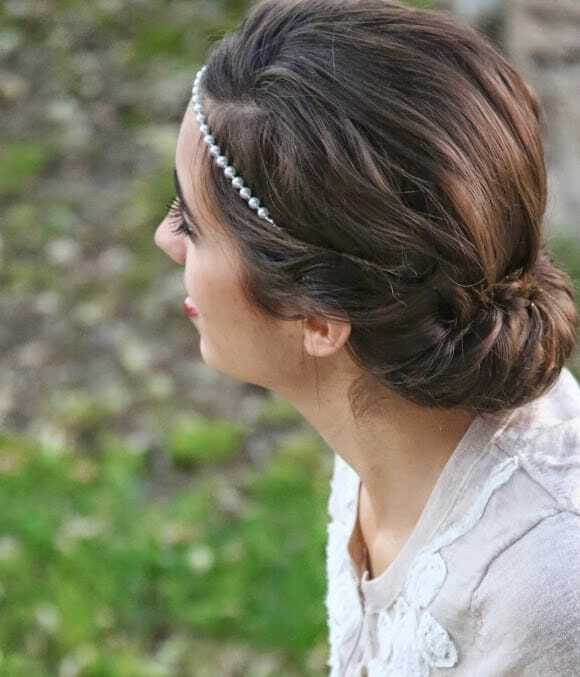 You can create this style with the Lilla Rose headbands! Chelsy’s hair looked stunning with the pearl headband. “Joy sent me the pearl hairband I selected for the giveaway, and I wore it for just a few minutes while my sister shot the pictures for this post. I was instantly HOOKED! I love the look of headbands, but 95% of the ones I’ve tried give me headaches, so I’ve almost resigned myself to the fact that I just can’t wear them. Until this one. The elastic band at the back is SO COMFORTABLE! It honestly didn’t even feel like I was wearing anything in my hair! The one that I am wearing in these pictures is the one I’m giving away…but after wearing it for just those few minutes I knew I had to have my own so I went and ordered two more, the pearl one and then also a jet black one. I am so excited to get them + incorporate them into my outfits-they add so much! I almost always wear my hair down, and am always on the lookout for ways to dress up the “down” look. 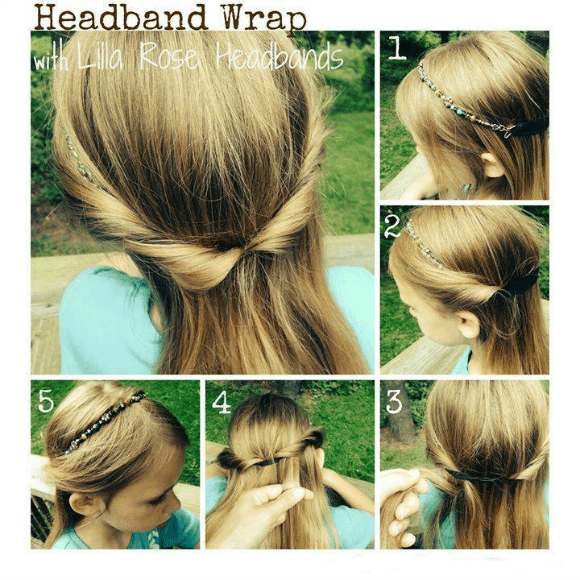 I totally agree with her–Lilla Rose headbands are the absolute best! 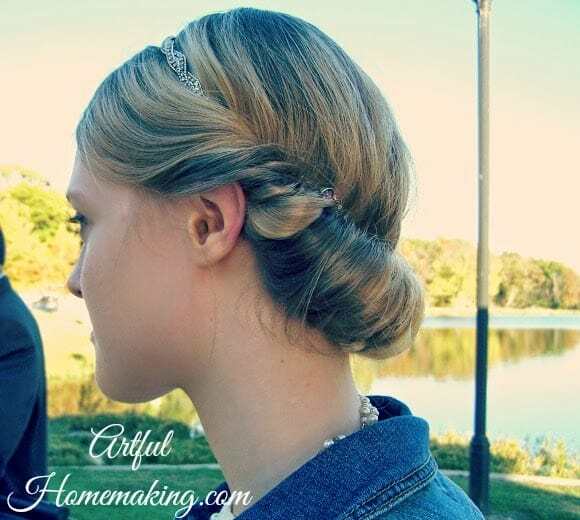 If you have too much hair for the roll above (or you prefer your hair down), you can also try this simple headband wrap, where you just wrap a bit of hair around the headband (and secure with bobby pins–these are the Lilla Rose Princess Tiara ones) and let the rest of it hang down. Here’s a simple tutorial for creating the headband wrap. Set the headband on the crown of your head. Wrap one side section of hair around the headband and pull through. Continue adding small sections of hair and wrapping them around the headband and pull through so they hang down. Adjust it until it’s the way you want it, and add some bobby pins to secure. And now I come to the sale part! 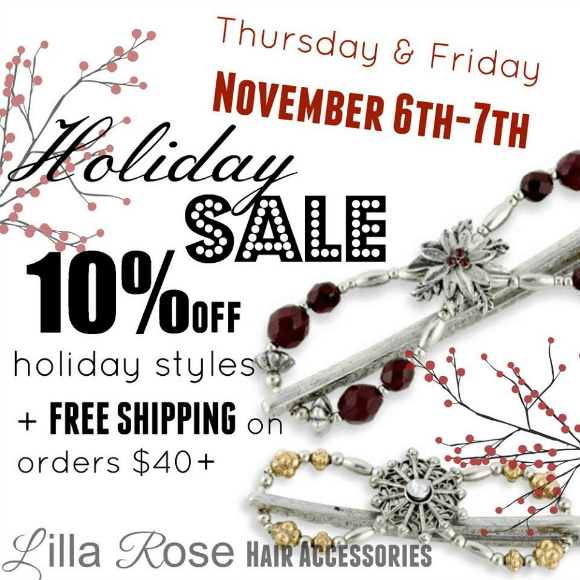 Lilla Rose is having a 2-day sale, today and tomorrow. 10% off holiday styles and free shipping on orders over $40! 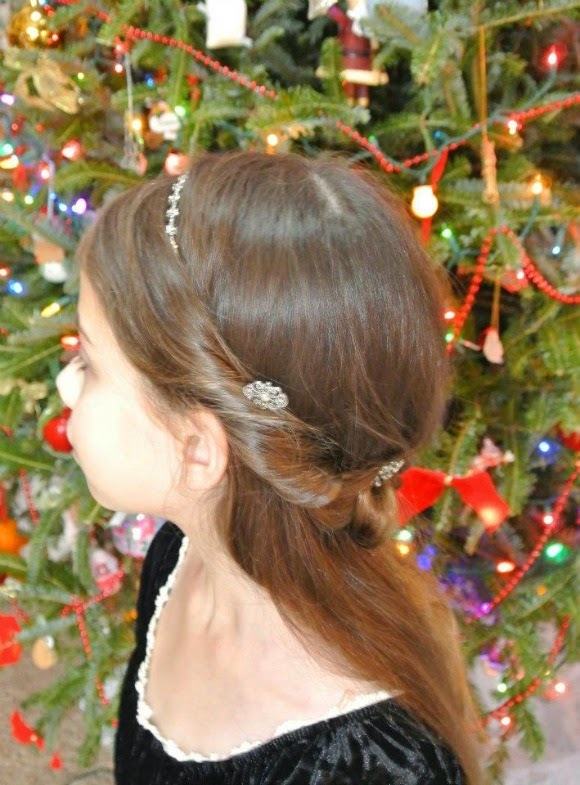 Now is the time to order any items you want to have on hand for holiday hairstyles or gifts! Go here to shop!